Irish immigrant Florence Burke has lived in Massachusetts for more than a decade but he's still a tenant farmer and his family lives in near-poverty. He came to America for a better life, but finds his adoptive country less than hospitable. Buy Book or E-Book Here! Florence recognizes that owning land is the path to prosperity, but the bank won't grant him a loan and he's running out of options. 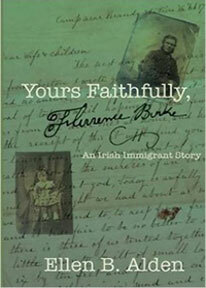 Yours Faithfully, Florence Burke is based on nineteen original Civil War letters from my great, great grandfather to his wife and children. It is a story of one Irish immigrant in a million struggling to make it in America at a time when the nation is divided. I’m a first time author with a story to share. 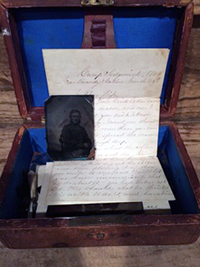 I discovered an antique leather box in my attic which contained Civil War letters written by my great, great grandfather. He was writing to his wife and three children at home in West Springfield, Massachusetts. Ever since that day I have worked tirelessly to learn their story and bring it to life through this novel. I am a graduate of St. Michael’s College in Vermont, I earned my teaching degree from Pepperdine University in California and I attended Merrimack College Graduate School of Education. I have worked as an elementary school teacher and I have also dabbled in the wine business. I earned Wine certificates at Boston University’s Elizabeth Bishop Wine Resource Center and worked at Andover Liquors, The Vineyard and the Red Oak Winery. After living in Los Angeles, London and Boston, I call Andover, Massachusetts my home. I live here with my husband Michael, my three children Nathan, Liam and Jillian, and my two dogs Moxie and Jack Frost.